Small little details make a big impression. Cufflinks are the perfect accessories to express yourself. As far as suits are concerned, cufflinks make a big impact. They should be looked upon as a tool for styling. A man’s wardrobe needs at least a pair of cufflinks to complete an outfit. They are small decorative items that act in place of the buttons in securing the sleeve ends together and makes the cuffs fit snug around the wrists. History tells us that cufflinks can be traced back to the 16th century. This was the time when only a piece of string was used to tie the sleeve ends in place. Thanks to the French ingenuity, cuff fasteners were invented. First, it was made of decorative glass joined by chain. As the years followed, designs evolved and men took to wearing cufflinks as a fashion statement. Not all shirts require cufflinks. Dress shirts usually require cufflinks to fold back and fasten the cuffs. A rule of thumb to knowing when to wear one is to check if your shirt have buttons or double cuffs. Cufflinks are commonly worn for formal and semi-formal events, as of course with business attire. This accessory comes in a variety of styles, shapes, materials and colours. A pair of cufflinks inject a touch of personality in anyone’s outfit. For formal occasions, wearing cufflinks with a classic design in a subtle colour is the best choice. Cufflinks are not just functional, they can also be worn to add character into any outfit. If you want to look stylish but not distasteful, a pair of cufflinks embellished with stones is a great option. 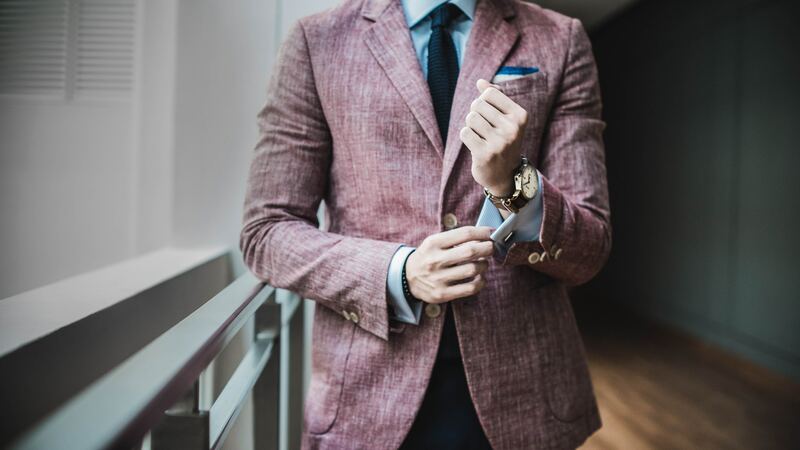 For business attire, it is also a wise choice to steer clear of anything too colorful. Leave over-the-top designs to the oligarchs if you must. It features no moving parts and it is smaller compared to other designs. It features two round-studs, with one part slightly larger than the other. The stud cufflinks hold two parts of the cuff together. It is the most common type of cufflink. It features a form of decorative detail on one side and a small bullet-shaped clip on the other end. This type of cufflink is ideal for guys who like to wear their shirt with a snug fit. If you want something more decorative, the chain link is the perfect choice. Most cufflinks are held in place with a metal bar but this type features dual-sided chain link to keep the cuffs in place. This style of cufflink does not feature any moving parts in its design. Most fixed back styles are reversible and give you two pairs of cufflinks with just one piece. When choosing cufflinks, always go for the clean and simple designs. Don’t wear cufflinks that will draw everyone’s attention. It’s okay to choose a style that’s scene-stealing but it’s another thing if it will make you look like a clown. Be creative when it comes to colors, patterns and shapes but never go overboard. Accessories such as cufflinks are designed to complement your outfit not overpower it. Lastly, choose high-quality cufflinks that are designed to last a long time. The Hottest Celebrity Jewelry Trend Happening This Season – HOOPS!